As a young man raised by a single deaf mother and surrounded by deaf family and friends, I see education as crucial in my life. So I was excited by my recent opportunity to meet with the U.S. Department of Education at their executive headquarters in Washington DC, thanks to the “If I Had a Trillion Dollars” national youth film festival. What I experienced there gave me more confidence that youth can work with officials to change the future, OUR future, for the better. I was part of a group of 65 young filmmakers from across the country who came to DC to share our videos answering the question, “What would you do with $1 Trillion to better your family, community, country?” As participants in the festival, we researched the federal budget, including the 60% of $1 Trillion spent on the military, we practiced speaking with legislators and staff, and we got to know each other. 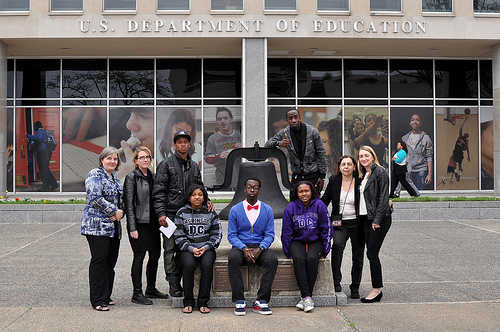 Then some of us, from New York and Chicago, also had the amazing experience to meet in person with executive staff, appointed by the President and his Education Secretary Arne Duncan, and show our videos and share our perspectives. They were extremely welcoming, appreciative of the videos and very interested in what we had to say. It seems as if New York and Chicago students all had the same issues. Overcrowded classrooms. Increased school closings. Many students of different ages having to share one building. Inconvenient travel times to reach school. The stereotypical uncomfortable relationship between teachers and faculty and students. 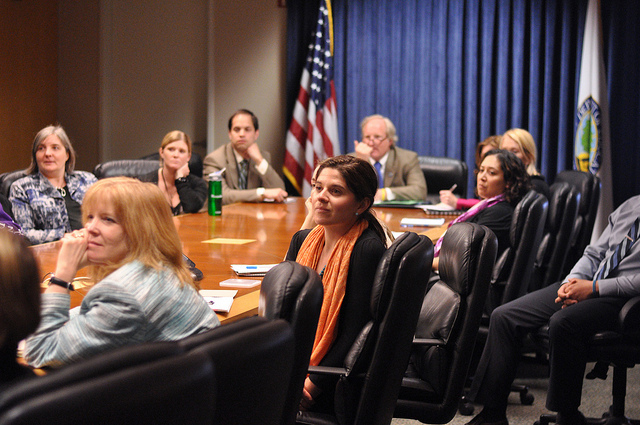 The executive staff not only listened but they asked us to share personal experiences. They asked questions showing compassion and interest in us as individuals. One staffer solicited our personal thoughts on how to bridge the relationship between teachers and students to make it much stronger, how we can make a stand for better funding, and more. He also challenged us to take his e-mail and stay in contact, and take advantage of the contact to build stronger involvement in school related programs and enriched education ideas. 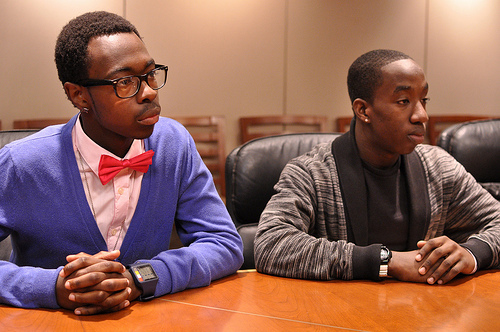 IHTD Youth Filmmakers AJ and Kasiem (author) in meeting with Department of Education. I answered that challenge by stressing the use of diverse arts from music to film and the power of campaigning with social media. Another staffer asked me to create a plan and send it to him. I was fascinated by the bond and connection we established throughout the meeting. There was a natural feeling of respect and unity as well as an overall understanding of the privilege at stake from both sides. It was a huge first step towards a yearly collaboration and check in with those charged with directing our education. Whether change starts today, tomorrow, next week, next month or in 10 years this meeting was a step towards a brighter future for us all. Kasiem is a 17 year old senior at Manhattan Business Academy. He lives in Brooklyn New York and is co-creator of ADOBE Youth Voices, a multimedia company that uses music, video, film and social media to educate and entertain youth.